FiiO Android M11 HIFI Music MP3 Player with Balanced Output/Support WIFI/Air Play/. The Micro SD card slot 2 on the M11 is the original one while the slot 1 is the expanded one, so the slot 2 has better compatibility and faster speed. Important Note: The device has a copy of non-international version of Android 8.1 (Google service currently unavailable), a international version of the Android OS could be available in the future, as in the past, Hiby did release a firmware update to add Google service for the previous generation Hiby R6 player. Player only. Color: Silver. To music from "listening" to "feeling" fun. Depending on the foreign transportation situation, the period during which the item arrives is uneven. Trending at $267.00eBay determines this price through a machine learned model of the product's sale prices within the last 90 days. Audio Format Support: FLAC,WAV,DSD,AAC,AIFF,WMA,ALAC,MP3,APE,OGG. Model Number: X7 MarkII. Signal Noise Ratio: ≥110dB. Operation Mode: Touch Screen. Body Material: Aluminum. Style: HD Video MP3. Battery Life: < 10 hours. If you are looking for Audiophile quality the D3 will suit your perfectly, the D3 has the ability to reproduce your digital audio collection at standards that will leave your ears lusting for more, more and more - Golden Ears (Cowon CEO) has done it again! Onkyo DP-X1 Digital Audio Player Hi-Res 32GB (w/ ROOTED Android O/S). (ONKYO Digital Audio Player (32GB Model) DP-X1. =:) « Show less. SIM slot: nano SIM x 2 (slot independent of micro SD x 2). SIM 1: 4 G LTE, 3 G compliant, SIM 2: 3 G, 2 G compliant. Installed OS: Android ™ 6.0 (Marshmallow). Built-in storage: 128 GB Including Android system area (RAM: 3 GB). Trending at $481.28eBay determines this price through a machine learned model of the product's sale prices within the last 90 days. 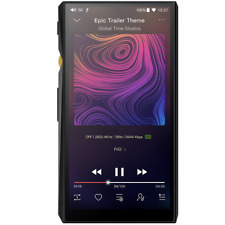 New FiiO M6 Hi-Res Android Based Music Player with aptX HD, LDAC HiFi Bluetooth, USB Audio/DAC,DSD Support and WiFi/Air Play.  Audio Format Support: DSD,APE, FLAC,WAV,MP3, WAV,MP3,OGG,APE.  Model Number: M6. FiiO X7 Mark II Smart Android-based Hi-Res Music Player With AM3A Amplifier Module - (64GB Titanium). FiiO refined their original X7 to bring the new and improved X7mkii to the market. High-Resolution Audio Player & DAC. Model: AP80. Supported File Formats:FLAC,APE,AIFF,ALAC,AAC,ASF,WMA,DSD,WAV,MP3. DAC:: ESS Sabre ES9218P. Connectivity: Bluetooth. Battery Life (Hours): 10 - 20 hours. Samsung Galaxy Player YP-GB70 With a 5 screen running at 800x480. Samsung Galaxy Player YP-GB70 (included the battery). It has HDMI port, so you can connect it to your TV. • A high performance wireless HiBy player both as a Hi-Fi audio device and Android device. Hi-Res Android Digital Audio Player. Silver (Stainless Steel). • Features World-First Direct Transport Audio Technology, Dual ESS DACs, Snapdragon 425. Android 4.4 Quad Core Car GPS DVD MP5 Player Bluetooth 2 DIN 6.6'' WiFi lot BH! Silicon Rubber Case. Storage Expansion type - Micro SD Card. SD Card Slot Needle. DAC - ESS9028Q2M x2 one for each channel. USB Type C Cable. CPU Model - Snapdragon 425 SoC. In The Box. Included: 1 x Car MP5 Player. OS: Android 8.1. When installing the machine, be sure to connect the wire correctly. If it can be powered on normally, then it may be due to the problem of wiring, you can ask for our help, so that you can use the product better. Included: 1 x Car MP5 Player. OS: Android 8.1. Gamma value: 0.45. When installing the machine, be sure to connect the wire correctly. If it can be powered on normally, then it may be due to the problem of wiring, you can ask for our help, so that you can use the product better. Hi-Res corresponding Walkman "NW-ZX2" Main Specifications. Platform Android 4.2. HiRes sound playback support Correspondence. 2 Hi-Res sound source FLAC 192kHz / 24bit mode. "NW-ZX2" headphones · microSD card is non-bundled. In addition to the best-in-class DAC and amplifier, also equipped with Android OS. Note . [ Rerun Policy]. HDD space: 131072 MB. Born to searching for a high-quality form part of pursuing high-quality further. Color variations: none. In the high-quality polished. There are no scratches, on the surface. 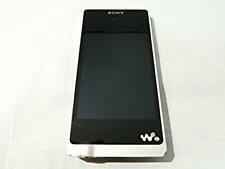 ・| IMPORTANT NOTICE | This Z-Series Walkman is made for Japan market. Manuals, UI (User Interface) and X-App (requires Japanese Windows 7/Vista /XP ) are in Japanese only. Warranty: 1 year ( valid only in Japan). WiFi function. Included: 1 x Car MP5 Player. Support reading U disk (audio / video / picture playing). OS: Android 8.1. Radio frequency: FM 87.5~108.0MHz. Gamma value: 0.45. When installing the machine, be sure to connect the wire correctly. Please click on "SEE FULL ITEM DESCRIPTION" before purchasing to view full details first thanks. Model: AP200. Country/Region of Manufacture: China. YOU ARE ONLY BUYING WHAT IS IN PHOTOS. Samsung Galaxy A8 SM-A800S 5.7" 32GB Android 7.0 NOUGAT Smart Phone LTE (included the battery). Samsung Galaxy A8 With a 5.7" screen running at 1920x1080(FHD). Silicone case Charging cable. Suitable for purchasing a single photocard. SAMSUNG Galaxy S3 SHV-E210S 4.8" Android 4.4.4 16GB Smart Phone Unlocked (included the battery). Samsung Galaxy S3 With a 4.8" screen running at 720x1280. Silicone case Charging cable. It doesn't have a back cover though, silicone case is fitted to a phone well. Choose any album or song or sit back and enjoy channels. User selectable screen visualizers match the rhythm of your music for a unique visual experience. What you see in the pictures is exactly what you will receive! Acer 21.5" Android ARM Cortex A-9 All-in-One Touchscreen PC - DA220HQL. Series DA220HQL. Processor 1.2GHz Cortex A9 Processor. Touchscreen: Yes. Date First Available May 7, 2013. Warranty and tech support are supported by manufacturers. Model number:SA3CNT08K. Model: GoGear Connect 3 8GB Mini Tablet With WIFI Video Player. Playback Format : WMA, MP3, VBR,WAV, 3GPP, AAC, AMR-NB, APE, FLAC, MIDI, Ogg Vorbis. Wireless LAN WIFI 802.11 b/g. This has been tested and it is in good working order, but the sound system is faulty, sold for parts only. This is in good physical condition as pictured.